Regular $4 Promo $2.50 each. DIY. 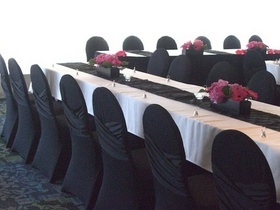 Description:An eye-pleasing criss-cross design at the back of the chair is the ideal touch for your reception. Ideal for Banquet Chairs. Sash is not needed. Set-up and take-down are available for $4.50 per cover.